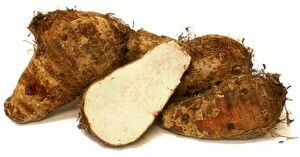 Malanga is a potato-like root crop that needs a year in the ground and a reliable source of supplemental irrigation. Malanga is grown for its starchy corms, an important food staple of tropical regions. A speciality vegetable facing proce pressure from imports, malanga is nevertheless a significant part of the cropping program in Florida (USA). We are going to focus on the experience of a second generation farmer in South Florida who has grown malanga all his life, beginning at the side of his father. For a few years they irrigated with overhead big guns. Now they have center Pivots and linears that take the place of 60 overhead rigs. They get the job done a lot quicker, and the savings in their irrigation labor costs is phenomenal. With Pivots they need one man, one machine and one pump, so they save a lot of money. Growers are impressed with the way linears and center Pivots apply water in all weather conditions. Whether it’s warm and calm like it usually is in the fall, or hot and breezy like it can be in the spring and summer, there’s virtually no water wasted. They can irrigate 24-hours a day all year long if that’s what the crop needs. That’s particularly important with malanga, which takes a year or more to reach maturity. That’s why malanga growers must irrigate throughout the hot, dry and windy summer months in South Florida. A tropical crop which originated in Central and South America, malanga has also been grown for centuries in Cuba and Puerto Rico. South Florida’s diverse population assures a steady local demand for this root vegetabke with large green leaves that can measure more than 2′ across. Edible tubers which form in the soil at the base of the plant are harvested, processed and added to recipes much like potatoes. And like potatoes, malanga has a distinctive starchy taste, yet with its own unique flavor. Malanga is relatively easy to grow if it’s possible to control the stubborn grasses with herbicides and some hand labor. As the crop matures and fills out, grasses present less of a problem. Malanga growers irrigate about once a week starting soon after planting and continuing all year long, depending on weather conditions. Planting to harvest takes around 12 months, sooner with sandier soils, longer with heavy clay. With a Pivot on sandy soils, a farmer could harvest in as little as 10 months, applying about 1.5″ of water per pass. The farmer in question runs the center Pivot 36 hours at 30% to cover 123 acres of malanga. An adjacent field of sweet corn is irrigated at 60% for an application rate closer to 0.75″ per pass. They rotate malanga with corn so they have two crops under irrigation at all times. Their system pumps 1500 GPM so it takes 36 hours for each water application on malanga, 18 hours for corn. One response to "Growing malanga with Pivot irrigation"
I love malanga, I want to grow my own. More flavor and heartier than potatoes. Thank’s for the info!